Sal Garcia is a San Francisco Bay Area painter, sculptor, printmaker, and jewelry artist. Welcome to the Jaguar Azul website, featuring the art of Sal Garcia. Sal's love of color and pre-colombian design are reflected in this work which is influenced and inspired by the art and mythology of the native people of the Americas at the roots of his own ancestry. The Blue Jaguar (sacred Jaguar, Precious Jaguar) a shamanic figure, magician healer. The Jaguar Azul is Sal's muse and Nahual (animal totem) and is his spirit guide that takes him traveling to the dream realm of other worlds, a world of phosphorescent jungles filled with colorful flowers and shamanic beings, a place where the colors are as symbolic as the forms. ''This new way of painting was the key to unlock a new world of symbols and color." Sal started making art at a young age, studied art in California and Mexico, worked with a variety of arts organizations, and was involved in the artistic and social movements supporting civil rights and Chicano rights. Sal had a spiritual and artistic rebirth in the 1990s in the American southwest and credits his tenure at the Crashing Thunder Gallery in Gallup, New Mexico with Professor Milan Sklenar, photographer and high desert mystic, as being paramount in this transformation. Today you will find that several themes are consistent throughout much of Sal's work: shamanic dreams, pre-Columbian myth and aesthetic, music, and the dynamic interplay of color, light, and symbolism. 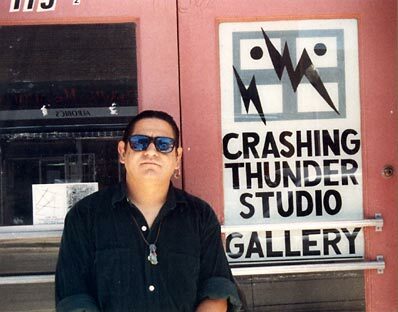 Sal wants to express his heartfelt thanks and appreciation to Professor Milan Sklenar of Crashing Thunder Gallery, Raechel M. Running, the Lopez Family, and many other artists who have provided generous support and who hosted him in the Southwest. He wishes to thank Gary Rashid for his support and friendship; Mr. Carlos Santana, whose patronage the artist is eternally grateful for; his wife Lori for her support in all his endeavors, his web designer, Barbara, for all her hard work; and his many supporters around the country and beyond.